6 Ford GT70s were made in the early 70s and there are a few models of them around. 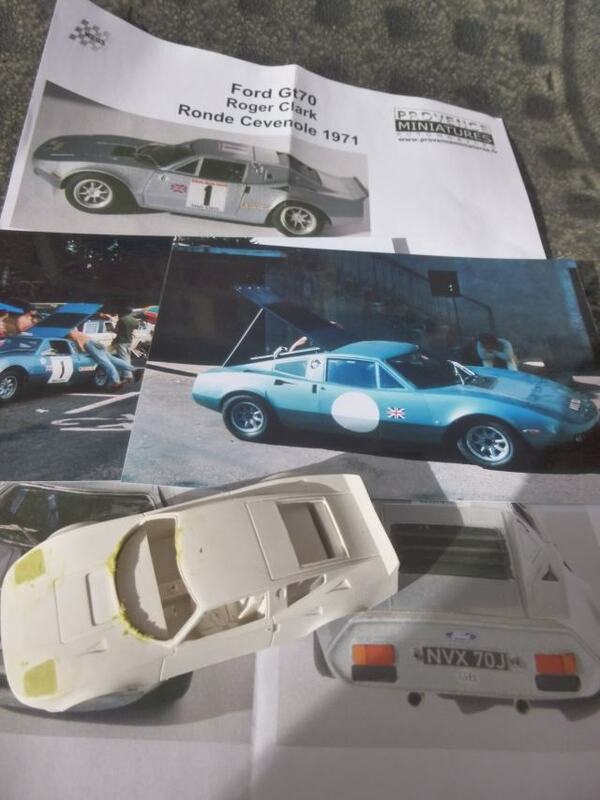 I am just making the Provence Miniatures Ford GT70 of Roger Clark & Jim Porter from the 1971 Ronde Cevenole Rally to add to Jim Porter's collection. The kit is by Provence Miniatures in a hard and very brittle resin. Really hard to sand off the flash without taking even more off, hence all the filler. The headlight covers fell to bits and the base plate snapped in half!! Their instructions give this car as silver. Jim thought this was wrong and remembered the car being metallic blue. So digging into his archive he came up with these photos and he was right!!! 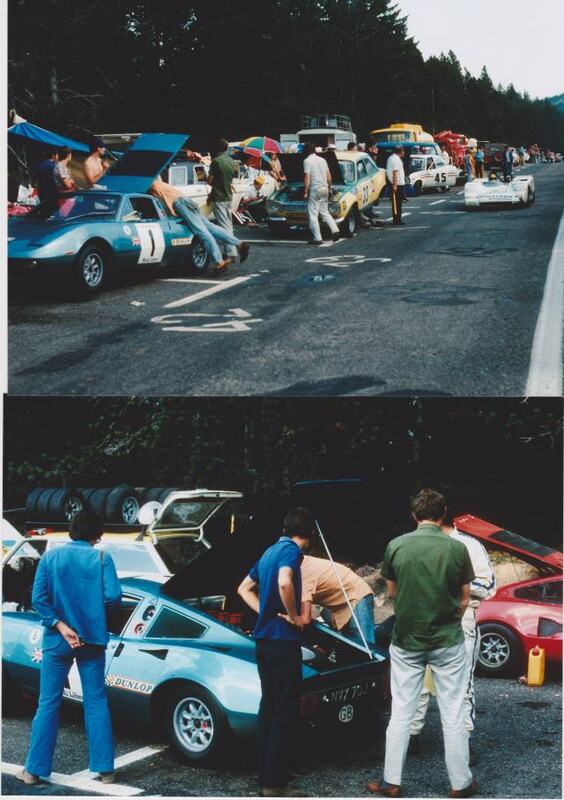 This car is registered as NVX 70J and it also appeared in silver but not on the 1971 Ronde Cevenole. It has also appeared in the yellow and green BP colours and this car is currently on loan to the Beaulieu Motor Museum. Very nice Chris. I used to be a member of the AVO owners club back in the late 80s when i owned my mark 1 Mexico and one of the silver GT70s was at the annual day one year. I have a picture somewhere. Hadn't seen one of those before, CD! But then I'm still a newbie in the land of the blue oval! From the photographs, that mechanic was a heavy lad, wasn't he? 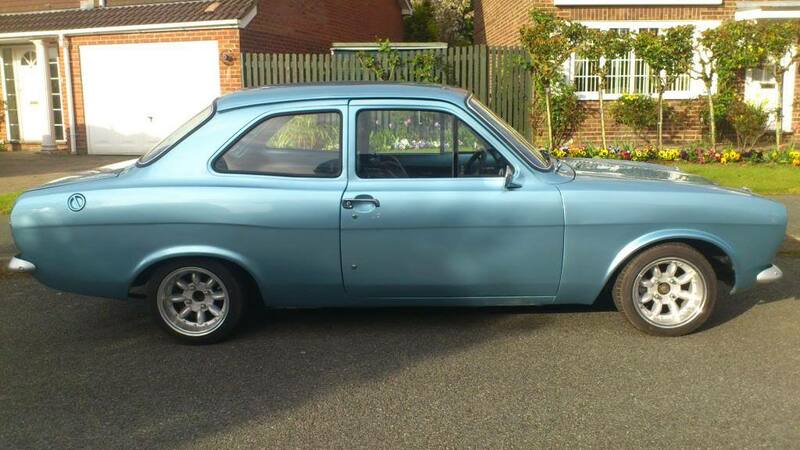 Leaning on the rear of the car has lifted the front wheel clear off the ground! Great that Dave has been able to identify the shade of blue for you - a great example of what a wonderful place this forum is. Well done Dave!! I can so empathise with you regarding old and fragile resin body-mouldings. I'm stuggling with the 911 flatnose rallycross transkit I bought from you in that I was taking it for it's last spray of Rob Gibson yellow when I accidently dropped it about 10" onto the dining room table.... and I ended up with the body in three pieces. I have now stuck the three pieces back together, managing to break a different part of the roof off (from the large portion that came off before!) in the process and will be looking to gentle sand the rough edges and fill the gaps before painting again. Set me back 2-3 weeks, but I'm looking forward to the result as much as Rob and Shirley Gibson are! !